Our brains use relativity to make comparisons when assigning value. Relativity is one of my favorite concepts and part of the behavioral economics foundations. Today’s show builds upon last week’s behavioral economics podcast on anchoring and adjustment, because these two concepts are closely aligned. Relativity is all about value. In this episode, I dig deep into relativity to make sure you really understand what it is. Then I get into all the examples for varying industries and circumstances, so that you can apply this concept in your business. I also talk about how to increase sales by creating three offerings. [07:00] Last week we talked about anchoring and adjustment. 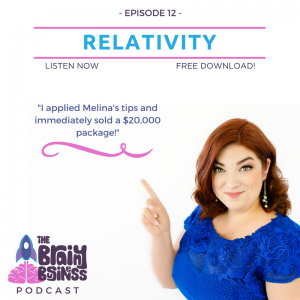 I also mentioned relativity several times in the behavioral economics podcast, because the two concepts are very much aligned. [09:59] In behavioral economics, relativity is about value. [10:50] How relativity applies to value. Our brains make comparisons to assign value to things. [11:54] When it comes to value everything is relative. Just like in the grilled cheese example (episode 8), we know that $200 is a high price for a sandwich because we can compare it to other things. [12:11] Our brains are constantly making comparisons between items. Even though, those comparisons aren’t always the most logical. [12:25] A simple example on how relative values can shift. [13:49] The will to save $15 depends on the item it is attached to. The difference between saving $15 on a dollar item and a $500 item is relative (but it shouldn’t be). [14:45] How people will drive across town to save on gas. Even though, the savings may not compensate for the time and expense of driving across town to purchase that cheaper gas. [16:58] An example of how silver medalists aren’t happy with coming in second. [18:40] How to incorporate relativity in a retail shop. [18:59] Anchoring and adjustment works together with relativity. An example where seeing a $99 t-shirt when walking in a store makes the real price of the shirts seem much lower even though it may be higher than last year’s price. [20:28] The purpose of the $99 shirt is to make other prices look low. [21:44] An example of how setting an expensive espresso machine next to another one will help it sell. The high anchor makes the other pricing look more affordable. [23:22] Three option pricing advice. Offer a best thing, something similar but worse, and something completely different. [23:50] I share how this worked in my online strategy session in Episode 10 On Air Strategy Planning Session with Mariel Court. [24:30] In the earring comparison example, find a favorite color or birthstone to create a comparison example. Have a slightly more expensive pair that is more than double in size. This uses relativity to show the better value. Also include a completely different pair that is at least the price of the best pair. [26:07] When given three choices most people will pick the middle choice. [26:09] A furniture store example. Start with the most expensive option and work your way down. You want to set a high anchor not a low anchor. [28:10] A real estate example by Dan Ariely. [29:09] We like to make decisions based upon comparisons. Even if those decisions aren’t rational. [30:10] Including a decoy will help create a point of comparison. [30:52] An example of the value of relativity from The Economist. Using relativity to sell subscriptions. [32:29] How removing an option that no one buys makes sales go down. This is the power of relativity in action. [33:46] When setting prices consider the decoy. If you are offering a service, look at the packages you are offering. Have a great value and a worse value and then a completely different product. Your brain wants to feel like it completed the due diligence to make the best decision. [35:58] An example of how a high priced bundle actually made another high-priced offering seem affordable. [37:22] A diet example that compares calories burned to calories consumed. You have to run 50 minutes to burn off one can of soda. Finding the right point of relativity can help encourage healthy behavior. [39:43] Hopefully you can see ways to incorporate relativity into your business. [42:19] Be sure to tune in next week for one simple mindset adjustment that will change your life and business forever. Episode 8 What is Value?